The amount of time required to cook pasta to its proper doneness varies depending on its size, shape and thickness. Also, whether the pasta is fresh or dried greatly affects the amount of cooking time required. 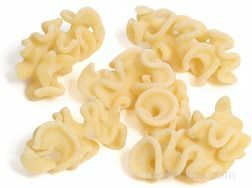 Cooking times can vary from 1 to 2 minutes for some of the fresh pasta to more than 15 minutes for some of the larger and thicker dried pasta shapes. 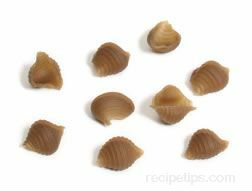 Methods for checking the doneness for dried and fresh pasta are shown below. Dried pasta is available in many shapes and sizes, which can cause the cooking times to vary greatly. 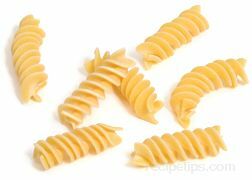 The larger, bulkier pasta shapes will take more time to cook than the more delicate strands of pasta or soup pastas, but they can all be checked for doneness in basically the same manner. Generally the pasta package will show suggested cooking times, which is beneficial because it provides a starting point. Visual: Check the package for the minimum cooking time suggested for the quantity of pasta you are cooking and then begin checking for doneness approximately 1 or 2 minutes before the suggested minimum time is up. If the pasta is not done, continue to cook and check every 30 seconds until done. Visually check the pasta to see if it has started to swell slightly and watch for it to begin rising to the surface of the boiling water. Both are indications that the pasta is getting close to done and that you should start to check it. 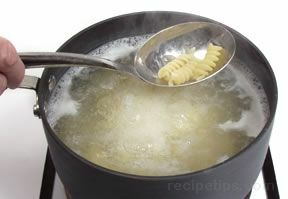 Lift a pasta shape from the boiling water using a slotted spoon. Cut the pasta in half and check the center, which if the pasta is done, it should not have a white ring or spot in it, or be opaque in appearance. 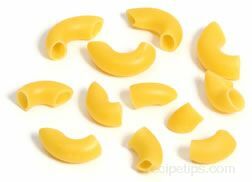 The pasta should be uniform in color. When cooking strands of pasta, if the strands do not drape easily over the spoon, they need additional cooking time. 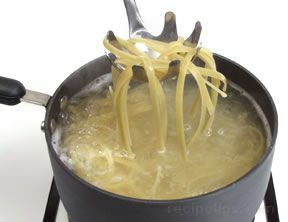 If the strands of pasta drape easily over the spoon when lifted from the water, they are cooked to the proper doneness. 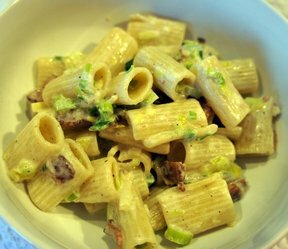 Taste: Tasting the pasta is probably the best way to determine doneness. Check the package for the minimum cooking time suggested for the quantity of pasta you are cooking and then begin checking for doneness approximately 1 or 2 minutes before the suggested minimum time is up. If the pasta is not done, continue to check every 30 seconds until done. When the pasta is done it will be tender but still have a slight bite to it. Cooking pasta to this point of doneness is called "al dente," which is Italian for "to the tooth". If the pasta is overcooked it becomes mushy. It is better to have it undercooked rather that overcooked. 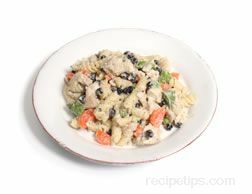 The pasta should be slightly undercooked if it is going to be added to another dish, expose to further cooking, or added to a hot soup. Fresh pasta cooks much faster than dried pasta and must be watched very carefully to ensure that it is not overcooked. 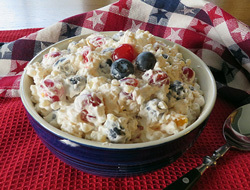 The fresher it is the faster it will cook. Fresh pasta starts out soft and doughy and then firms up as it is cooked. Taste: Tasting fresh pasta is the best way to check for doneness. 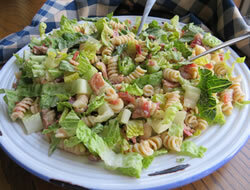 If the pasta is very fresh and moist it can cook within a minute or two. Generally after the pasta is put in the boiling water and the water begins boiling again it takes 2 to 4 minutes for it to get done. Checking for doneness should begin as soon as the pasta begins to float to the surface. 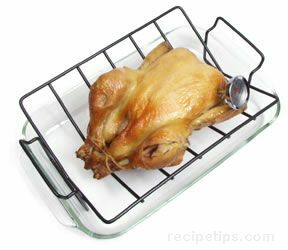 If it is not done, check doneness again every 15 to 20 seconds until it is done. It must be watched very carefully so that it does not become overcooked. Fresh pasta should be tender and slightly firm, but it will never be "al dente" because it is not firm textured to start. Whether you are cooking fresh or dried pasta, once it is done it should be removed from the heat and drained immediately so that the cooking process is stop. 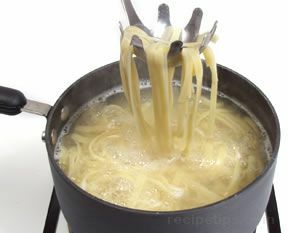 If the pasta remains in the hot water, it will continue to cook and become overcooked.